1) H.R.H. Crown Prince Sia’osi Taufa’ahau Tupoulahi Tupou, Tupouto’a-Tungi, who succeeded as H.M. Sia’osi Taufa’ahau Tupou IV, King of Tonga - see below. 2) H.R.H. Prince ‘Uiliame Tuku’aho Tupou. b. at the Royal Palace, Nuku’alofa, Tongatapu, 5th November 1919, educ. Wesleyan European Sch, Nuku’alofa, Tupou Coll, Nafualu. He d. at the Royal Palace, Nuku’alofa, Tongatapu, 28th April 1936 (bur. Queen Lavinia’s Vault, Mala’e Kula, Nuku’alofa). (1) Patrick Soeli-Fatafehi Fotu-‘a-Falefa Tupou-Tuipulotu. b. 2nd October 2001, educ. Waikiki Elementary Sch, and Kalani High Sch, Honolulu, Hawaii. (2) Tymothy Tupou-Tuipulotu, educ. Waikiki Elementary Sch, and Kalani High Sch, Honolulu, Hawaii. (1) Yehenara Lifusia-‘a-Fokololo Fifita-Holeva Pelenato Tupou-Tuipulotu Soukop. b. 12th December 1998. (2) Halaevalu-ta’anea Alice Rose Tupou-Tuipulotu. b. 29th February 2008. (1) The Hon Melenaite Tupou Mohe’ofo Tuku’aho. b. at Honolulu, Oahu, Hawaii, 21st October 2010. (1) Ramesh [Meshy] Ramanlal Vallabh. (2) ‘Uluvalu Fonua. b. 2013. (1) Paige SiuKaufusi Ramanlala Vallabh. b. 28th September 2004, educ. Queen Salote Coll, Kolofo’ou, Tongatapu. (2) Lavinia [Nia] Fonua. b. 2011.
a) H.R.H. Princess Mele Siu’ilikutapu Tuku’aho [H.R.H. Princess Mele Kalaniuvalu-Fotofili]. b. at the Royal Palace, Nuku’alofa, Tongatapu, 12th May 1948, educ. Anglican Diocesan High for Girls, Epsom, Auckland, New Zealand. MLA 1975-1977 (first woman people’s elected representative). 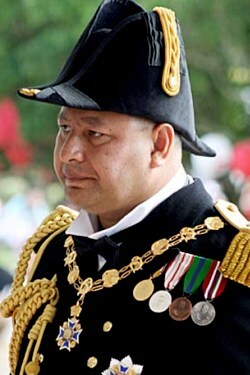 Grand Master of the Most Illustrious Order of Queen Salote Tupou III 31st July 2008. Rcvd: King George Tupou V Royal Family Order of Tonga (1.8.2011), King Taufa’ahau Tupou IV Coron Silver Jubilee (4.7.1992), King George Tupou V Coron (31.7.2008), and King Tupou VI Coron (4.7.2015) medals. m. (first) at Auckland, New Zealand, 28th October 1969 (annulled by Royal Decree, 28th November 1969), Siosiua Tu’iono Liava’a [Josh Liava’a] (b. at Nuku’alofa, Tongatapu, 1948; m. second, 1971 (div.) Leva’ai Nancy Wolfgramm. m. third, Victoria Liava’a [Leti Pikokivaka], from Vava’u. d. from gunshot wounds received in a shooting at Queen Hospital, Kahaluu, Hawaii, 14th July 2014, leaving four children by his second wife), educ. Univ of Auckland, New Zealand, a commoner of Tongan, New Zealand and Australian nationality, sometime Detective Sergeant New Zealand Police, rugby player with Northcote Tigers, Auckland, New Zealand Kiwis (World Cup squad 1975), and New Zealand Maoris (Pacific Cup squad 1977), Mbr NZRL Kiwis Assoc, fourth son of Siosifa Tevita Tongotongo Liava’a, from Ha’avakatolo, Hihifo, Tongatapu, by his wife, Moa ‘Autele Tupou. m. (second) at Fatai (civil), 21st October 1970 and at the Chapel Royal, Nuku’alofa, Tongatapu (relig. ), 22nd October 1970, Major The Hon Sosi’ua Ngalumoetutulu, 4th Kalaniuvalu-Fotofili, LVO (b. at Nuku’alofa, Tongatapu, 15th December 1936; d. at Auckland, New Zealand, 5th June 1999), eldest son of The Hon Semisi Fatafehi Fonua, 3rd Kalaniuvalu-Fotofili, sometime Speaker of the Legislative Assembly, by his wife, The Hon Sisilia Tupou Kalaniuvalu-Fotofili, elder daughter of Paula Tu’itavake Fanga. She had issue, two sons by her second husband - see Tonga (Tui Tonga). b) H.R.H. Princess ‘Elisiva Fusipala Tauki’onetuku Tuku’aho [H.R.H. 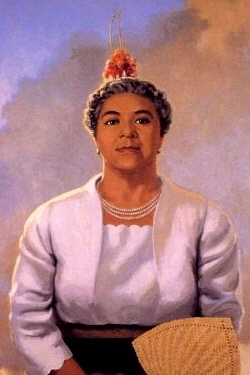 Princess Fusipala Vaha’i]. b. at Nuku’alofa, Tongatapu, 12th June 1949. Rcvd: King George Tupou V Royal Family Order of Tonga (1.8.2011), King Taufa’ahau Tupou IV Coron Silver Jubilee (4.7.1992) and King George Tupou V Coron (31.7.2008) medals. m. at the Chapel Royal, Nuku’alofa, Tongatapu, 13th March 1968, The Hon Hahano-ki-Mala’e Kula-‘a Sione Ngu Namoa, Lord Vaha’i, of Foui (b. at Kolosi’i, Fo’ui, Tongatapu, 1st May 1936; d. at Middlemore Hospital, Auckland, New Zealand, 22nd May 2005), sometime MLA, eldest son of The Hon Vilisoni Fahitaha Namoa, Vaha’i, of Foui, by his wife, The Hon Vika Kaufusi Vaha’i, daughter of Tevita ‘Unga Taufu’-i-‘aevalu, of Koulo, Lifuka. She d. at the Mills-Peninsula Medical Center, Burlingame, California, 2nd October 2014, having had issue, two sons and two daughters - see above. c) H.R.H. Princess Lavinia Mata-‘o-Taone Tuku’aho [H.R.H. Princess Lavinia Ma’afu]. b. at Nuku’alofa, Tongatapu, 4th April 1952. Rcvd: King George Tupou V Royal Family Order of Tonga (1.8.2011), King Taufa’ahau Tupou IV Coron Silver Jubilee (4.7.1992), King George Tupou V Coron (31.7.2008), and King Tupou VI Coron (4.7.2015) medals. m. at the Chapel Royal, Nuku’alofa, Tongatapu, 29th July 1980, Major The Hon Siosaia Lausi’i (Tukui’aulahi Ma’afu), 9th Lord Ma’afu-‘o-Tukui’aulahi, of Vaini, sometime Private Sec. to the King, son of The Hon Tevita ‘Unga Motangitau, 8th Ma’afu-‘o-Tukui’aulahi, of Vaini, by his wife, The Hon Peti Ma’afu. She had issue, one son and one daughter - see above. d) H.R.H. Princess Sinaitakala ‘Ofeina-‘e he-Langi Tuku’aho [H.R.H. Princess Sinaitakala Fakafanua]. b. at Nuku’alofa, Tongatapu, 6th September 1953. Rcvd: King George Tupou V Royal Family Order of Tonga (1.8.2011), King Taufa’ahau Tupou IV Coron Silver Jubilee (4.7.1992), King George Tupou V Coron (31.7.2008), and King Tupou VI Coron (4.7.2015) medals. m. at the Chapel Royal, Nuku’alofa, Tongatapu, 17th May 1984, The Hon Dr. Kinikinilau Tuto’atasi (Fakafanua), 7th Lord Fakafanua (b. at Siumafua’uta, Ma’ufanga, Tongatapu,20th January 1962; d. suddenly, at Hala Vuna, Ma’ufanga, Nuku’alofa, Tongatapu, 24th February 2006), sometime Minister for Finance, son of The Hon Fakafanua, by his wife, The Hon Kalolaine Lataifalefehi Fakafanua, fourth daughter of The Hon Tevita Manu-‘o-pangai, &squo;Ahome’e, sometime Governor of Vav’au and Ha’apai and Minister of Police. She had issue, two sons and one daughter - see above. 1) H.R.H. Crown Prince Sia’osi Taufa’ahau Manumata’ogo Tuku’aho Tupou, Tupouto’a, who succeeded as H.M. George Tupou V, King of Tonga - see below. a) H.S.H. Sitiveni ‘Alaivahamama’o Polule’ulingana Tanusia-ma-Tonga (Tuku’aho), Prince Tungi. b. at Vaiola Hospital, Nuku’alofa, Tongatapu, 25th June 1990 (s/o Alaile’ula), educ. Tonga Coll, ‘Atele, Tongatapu, and Wesley Coll, Paerata, New Zealand. Recognised as successor to his father and invested with the noble title of Tungi, of Fua’amotu, Tatakamotonga and Navutoka, at Fua’amotu, and granted the title of Prince Tungi together with the style of Serene Highness, 19th July 2008. Lord Bearer of the Crown since 2008. Rcvd: GC of the Order of the Crown (31.7.2008), King George Tupou V Coron (31.7.2008), and King Tupou VI Coron (4.7.2015) medals. b) The Hon Fatafehi Sione Ikamafana Ta’anekinga ‘o Tonga Tuita. b. 10th February 1994 (s/oAlaile’ula), educ. Tonga High Sch, Nuku’alofa, Tongatapu, and St Peter’s Coll, Cambridge, New Zealand. Adopted by his uncle and aunt, The Hon Siosa’ia Ma’ulupekotofa Tuita and Princess Pilolevu. Rcvd: George Tupou V Coron (31.7.2008), and King Tupou VI Coron (4.7.2015) medals. c) The Hon ‘Etani Ha’amea Tupoulahi Tu’uakitau Ui Tu’alangi Tuku’aho. b. 10th January 1995 (s/o Alaile’ula). Rcvd: George Tupou V Coron (31.7.2008), and King Tupou VI Coron (4.7.2015) medals. a) The Hon Salote Maumautaimi Haim Hadessah Ber Yardena ‘Alanuanua Tuku’aho. b. 14th November 1991 (d/o Alaile’ula). Rcvd: George Tupou V Coron (31.7.2008), and King Tupou VI Coron (4.7.2015) medals. 3) H.R.H. Crown Prince ‘Aho’eitu ‘Unuaki-‘o-Tonga Tuku’aho, Tupouto’a Lavaka, who succeeded as H.M. George Tupou VI, King of Tonga - see below. i) The Hon Phaedra Ana Seini Tupuveihola ‘Ikaleti Olo-‘i-Fangatapu Fusitu’a. b. 17th November 2003. Rcvd: Cdr of the Royal Household Order of Tonga (1.8.2011), King George Tupou V Coron (31.7.2008), and King George Tupou VI Coron (4.7.2015) medals. i) Reggie Kite-‘i-Mahina Taione. Found abandoned at Mahina Fekite, the residence of Princess Pilolevu, 8th September 2014.
i) The Hon Simon Tu’iha’atu ‘Unga George Ma’ulupekotofa Tu’ivakano. b. at Auckland City Hospital, Auckland, New Zealand, 14th April 2011.
i) The Hon Michaela Mary Rose Halaevalu Tokilupe Hala-‘i-Vahamama‘o Tu’ivakano. b. 21st May 2012.
ii) The Hon Fatafehi Lapaha Salote Koila Tu’ivakano. b. 1st December 2013.
i) Latu’alaifotu’aika Fahina-‘e-Paepae Tiantian Filipe. b. 12th October 2014.
d) The Hon Lupe’olo Halaevalu Tupou Mohe’ofo Virginia Rose Tuita. b. 25th July 1986, educ. Tonga High Sch, Nuku’alofa, Tongatapu, and the Univ of Auckland (BA 2014), New Zealand. Sometime Regent during the absence of the King from Tonga. Teacher at Tupou Tertiary Inst. Rcvd: Cdr of the Royal Household Order of Tonga (1.8.2011), King George Tupou V Coron (31.7.2008), and King George Tupou VI Coron (4.7.2015) medals. m. at the Free Wesleyan Church of Fasi-moe-Afi ‘a Tungi, Nuku’alofa,Tongatapu, 3rd June 2016, Lopeti ‘Aleamotu’a, educ.Akoteu Nuku’alofa Primary Sch, Tonga High Sch, Nuku’alofa, Tupou Coll, Nafualu, Tongatapu, Univ of the South Pacific, Suva, Fija, and Britannia Royal Naval Coll, Dartmouth, Devon, cmsnd as Ensign HMAF (Navy) 2012, Sub-Lieut RN 2/6/2016, second son of The Hon Mosese Tangaki-Taulupe-ki-Folaha ‘Aleamotu’a, sometime, Controller of Television, by his wife, Mele Simiki Taufa ‘Aleamotu’a, fourth daughter of Captain George [Siaosi] Abraham Walter, of Pangai, Ha’apai, late officer Merchant Navy. a) The Hon Fatafehi Sione Ikamafana Ta’anekinga ‘o Tonga Tuita – see above. i) Sia’osi Tupou Vuna Tu’inukuafe. ii) Sala ‘Aetau ‘Ulukihelupetea Tu’inukuafe. 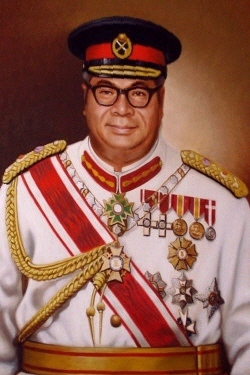 2006 - 2012 H.M. Sia’osi Taufa’ahau Manumata’ogo Tuku’aho Tupou V [George Tupou V], By the grace of God, King of Tonga. b. at the Royal Palace, Nuku’alofa, Tongatapu, 4th May 1948, eldest son of H.M. Sia’osi Taufa’ahau Tupou IV, By the grace of God, King of Tonga, GCMG, GCVO, KBE, KStJ, by his wife, H.M. Queen Halaevalu Mata’aho, educ. King’s Coll, Auckland, New Zealand, The Leys Sch, Cambridge, Queen Elizabeth House (Dept of International Development), Oxford Univ, and RMA Sandhurst. Designatd as Heir Apparent and Crown Prince, 16th December 1965. Granted the hereditary title of Tupouto’a 4th May 1966 and thereafter styled His Royal Highness Crown Prince (Tama Pilinisi Kalauni) Tupouto’a. Formally invested with the title of Tupouto’a, 17th May 1966. Cmsnd as 2nd-Lieut British Army 1968, attached 10th Royal Hussars (Prince of Wales’s Own), RAC, and served with British Army of the Rhine in Germany 1968-1969, joined Tonga Foreign Service 1969, Assist Secretary Ministry of Foreign Affairs 1970-1979, actg High Commissioner at the Court of St James’s 1972-1973, and Minister for Foreign Affairs 1979-1998. Succeeded on the death of his father, 10th September 2006. Installed as the 23rd Tu’i Konokupolo, at Mala’e Pangai Lahi, Nuku’alofa, Tongatapu, 30th July 2008. Crowned by the Anglican Archbishop of Polynesia at the Centenary Wesleyan Church, Nuku’alofa, Tongatapu, 1st August 2008. Colonel-in-Chief Tonga Defence Force 17/1/1969-10/9/2006 and the Tonga Royal Guards 17/1/1969-18/3/2012, Captain Tonga Defence Force Naval Branch 1995-2006, General and C-in-C of the forces 10/9/2006-18/3/2012. 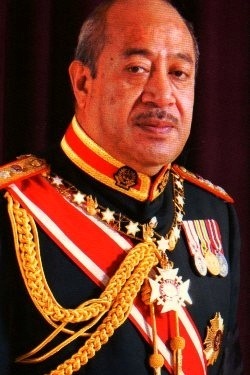 Sovereign and Patron of the Orders of Puono, the Crown, the Cross of Tonga, the Royal Order of King George Tupou I, the Tongan Star and of the Royal Family Order 10th September 2006-18th March 2012. Founder and Sovereign of the Most Illustrious Order of Queen Salote Tupou III 31st July 2008, the Royal Order of St George 2009, the Most Devoted Royal Household Order of Tonga 2009, and the Royal Family Order of Tonga 2009. Chair Tonga Traditions Cttee 2006-2012. Patron Tonga Tourist Assoc 1999-2012, St John’s Ambulance Brigade 2005-2012, Tonga High Sch 2006-2012, Tonga Amateur Sports Assoc & National Olympic Cttee (TASANOC), 2007-2012, Royal Endocrinology Soc 2008-2012, Fasi Ma’ufanga Rugby Club, Tonga Energy Road Map, etc. Chair Royal Beer Co Ltd 1987-2006, Shoreline Group Ltd 1996-2006, and Peau Vav’au Ltd 2004-2006. Dir Tonga Network Information Center (Tonic Corp) 1995-2006. 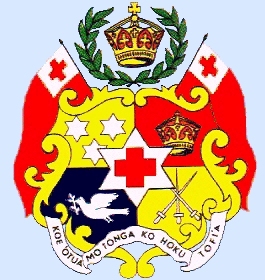 Rcvd: KGC of the Royal Order of King George Tupou I (5.5.1969, KC 4.7.1967), KC of the Orders of the Pouono (4.7.1967) and the Crown (4.7.1967), King Taufa’ahau Tupou IV Coron Silver Jubilee Medal (4.7.1992), Tonga Defence Services Meritorious Service Medal (4.7.1995), and Tonga Defence Services Long Service & Good Conduct Medal, GC of the Orders of the Brilliant Star (special grade) of Taiwan (27.1.1977), Merit of the Hungarian Republic (civil 15.9.2011), KGC of the the Orders of Chula Chom Klao (special class) with collar of Thailand, the Eagle of Georgia and the Seamless Tunic of Our Lord Jesus Christ (2010), and the Royal Order of Francis I of the House of Bourbon-Two Sicilies (28.2.2012), Officer of the Order of the Legion of Honour of France (16.4.1980), Benemerenti Gold Medal of the Constantinian Order of St George (28.2.2012), etc. He d. unm. while undergoing treatment for a renal condition at the Queen Mary Hospital, Pokfulam, Hong Kong, China, 18th March 2012 (bur. Mala’e Kula, Nuku’alofa, Tongatapu, Tonga) (succ. by his youngest brother). a) H.R.H. Prince Taufa’ahau Manumata’ogo Tuku’aho. b.at Auckland Hospital, Auckland, New Zealand, 10th May 2013.
a) H.R.H. Princess Halaevalu Mata’aho Tuku’aho. b. at Auckland Hospital, Auckland, New Zealand, 12th May July 2014. 2) H.R.H. Prince Viliami ‘Unuaki-’o-Tonga Lalaka mo’e ‘Eiki Tuku’aho, ‘Ata. b. at Nuku’alofa, Tongatapu, 27th April 1988, educ. Radford Coll, Canberra, ACT, Australia. Appointed to the title of ‘Ata of Kolovoi in Tongatapu and the island of ‘Atata, in succession to his father 25th September 2006, and invested with the title at Liukava, Kolovoi, Tongatapu, 27th September 2006. Rcvd: King George Tupou V Coron (31.7.2008), and King Tupou VI Coron (4.7.2015) medals. 1) H.R.H. Princess Angelika Latufuipeka Hala’evalu Mata’aho Napua ‘O-ka-lani Tuku’aho. b. at Nuku’alofa, Tongatapu, 17th November 1983, educ. Queen Salote Coll, Kolofo’ou, Tongatapu, International Univ, Geneva, Switzerland (BBA 2003), and the Australian National Univ (ANU) (MA 2011), Canberra, Australian Capital Territory (ACT), Australia. Administrator Shoreline Group 2004-2008, High Cmsnr in Australia since 2012. Patron Tonga National Youth Congress (TNYC), Tonga Football Assoc (TFA), etc. Rcvd: King George Tupou V Royal Famiy Order (1.8.2011), King George Tupou V Coron (31.7.2008), and King Tupou VI Coron (4.7.2015) medals.